Philadelphia Eagles quarterback Nick Foles prepares to take a snap against the Oakland Raiders during the third quarter at Lincoln Financial Field. Through the bulk of the Eagles season, football fans from across the nation were climbing aboard an express train in Philadelphia called the Wentz Wagon. Carson Wentz was – and is - the face of the next generation of exciting NFL quarterbacks capable of taking his team and his city to a Super Bowl championship. Carson Wentz was the reason the Philadelphia Eagles were lodged at the top spot in the NFL power rankings, fully capable of winning a Super Bowl this season. And then Wentz went down with a knee injury, and the resulting surgery left him featured in a suite for the Christmas night shaky victory over the Oakland Raiders. Nice to know he’s doing fine, but at this point it might do everybody best to put him well in the back of their collective minds and focus on Nick Foles at quarterback. In other words, it’s time we all stopped playing the Wentz card. What is that you ask? The Wentz card is the credit card for the future. It’s the temptation to be dismissive of any pothole this season, reasoning there is very likely a smooth highway up ahead. There is every likelihood that Carson Wentz is going to be the guy to win a Super Bowl for the Philadelphia Eagles. However, that bright future is no reason to just surrender the Eagles chances this season with the dismissive suggestion of a payday down the road. Perhaps no fan base in the history of Philadelphia sports will have a better reason to say “Wait ‘til next year” than Eagles faithful if they fail to reach their goals this season. But those words should not come into the play until AFTER this season, and that includes win or lose. There should be no built-in excuses for this team going toward the playoffs. The Eagles will have home-field advantage in a building where they have not lost this season, and they will have a defense that really should be able to make life miserable for any quarterback that faces them throughout the playoffs. Foles is a veteran who has literally been there and here before. He is one of the big reasons the Eagles front office is being praised far and wide as being the best in the NFL because they presumed depth problems and they filled those needs. Foles is about as good as it can get in terms of having a backup quarterback able to step in when the generational starter gets injured. Likewise, the Eagles front office stuffed the roster with players such as Jay Ajayi and LeGarrette Blount at running back so they could shift to a ball control offense in the case of an injury to Wentz. The front office also picked up kicker Jake Elliott, who has more than enough leg to win a playoff game that the Eagles keep close at the Linc. When a kicker is capable of kicking a field goal over 50 yards with regularity, all you’ve got to do is keep it close. Look at it this way: Despite subpar play, the Eagles won again at home, have won three times since Wentz went down (if you include the end of the Rams game), and they have done so without an “A” effort in the last two games. With Wentz running the show, the Eagles feasted on third-down situations, but on Christmas night against the Raiders, they converted just one of 14 attempts. The problem wasn’t on third down as much as it was the two prior when the offense could not gain enough yardage to make those third-down plays manageable. There are very few quarterbacks who are third-down magicians and the one the Eagles had is done for the season. So, the Eagles have to make those third-down situations more manageable for Foles. Then too, Foles should be better at discovering secondary receivers, and he should figure out that Zach Ertz is not as tall as Joel Embiid. But all in all, the Eagles have a defense that is stout enough, special teams that are good enough, and an offense that is varied enough that they should be able to battle their way though the playoffs. 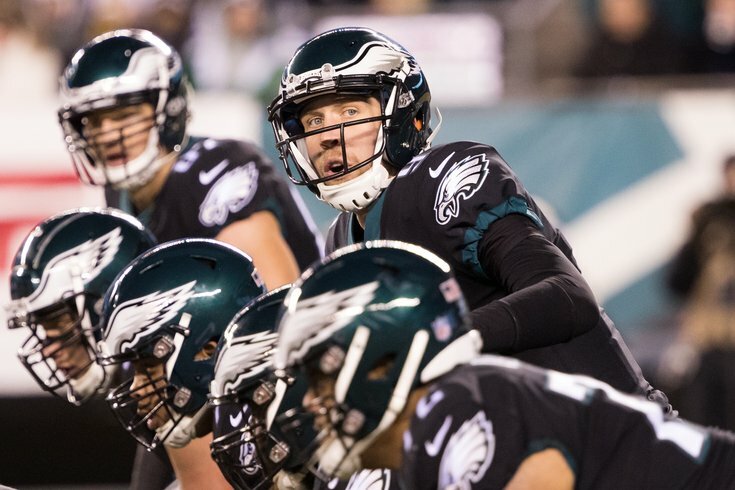 There are so many options available on offense that the Eagles should look a lot better than they did on Christmas night when Foles could not manage to get a couple of his most important receivers involved enough in the game plan. Glance at the standings and there you have an amazing record of 13-2. THIRTEEN and TWO! There is enough in the Eagles locker room to make this season special, so the suggestion that the rest of this season is going to end in misery and the cry of Wait ‘til next year, Wait ‘til Wentz is back is a foregone conclusion is wrong. Until then, put away the Wentz card.